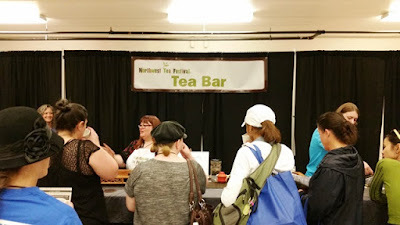 The 11th annual Northwest Tea Festival was held on September 29th and 30th in Seattle Center's Exhibition Hall. This was the second year in the new larger space and the festival has already grow considerably with more vendors and an impressive lineup of guest speakers and presenters. 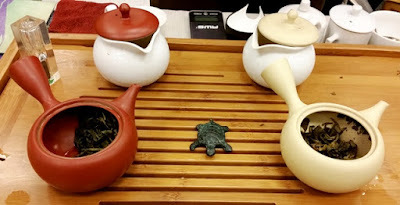 As with other tea festivals this year, the official tasting cups were held up in customs for an exceedingly long time (they may still be sitting in customs as I write this). Since this was becoming a trend, the festival organizers were able to plan ahead and sourced serviceable cups for any attendees who were unable to bring their own. There was certainly no lack of beautiful teaware offered by vendors this year for anyone who wanted to upgrade or expand their collection. 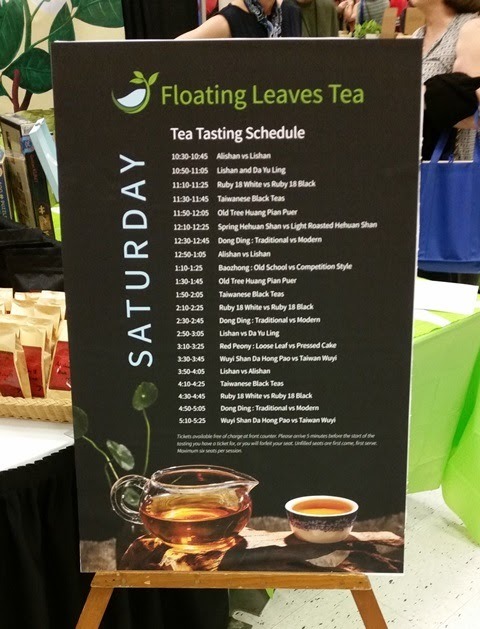 Since seating in scheduled tea tastings and workshops is limited, the Tea Bar offered a great opportunity for attendees to drop in for ~5-minute tasting and comparison sessions throughout both days of the festival. 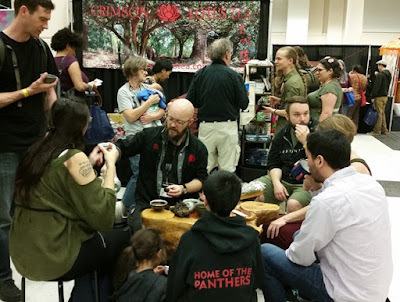 The Dawsons alongside other festival volunteers served up a wonderfully eclectic variety of teas including the Wild Grown White and Jinhua Silver Needle that I enjoyed. The Tea Bar expanded this year to include a Tea Tutorial Table where festival attendees could learn more about the teas their drinking. Volunteers rotated in to lead the tastings and I had the opportunity to taste Milk Oolong followed by Fuding Bai Cha (white tea, brick) served by Joan Chissus. Because you can never have enough tea, festival vendors provided complimentary tastings of their teas, often with a bit of flair. 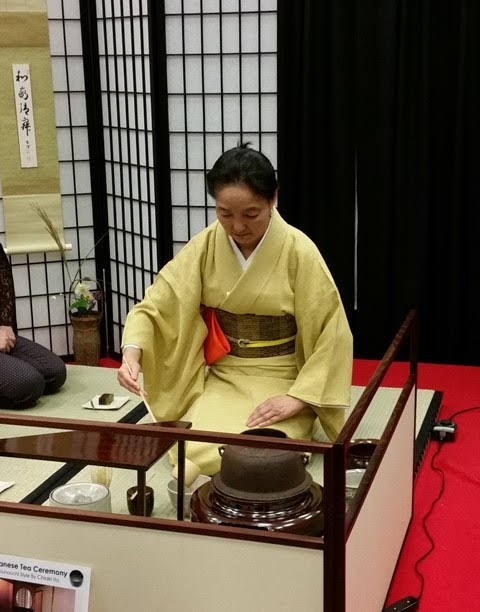 Tea ceremony demonstrations were held at the Sugimoto Tea booth, performed by certified Yabunochi School instructor Chiaki Ito. It's always interesting to see the variations between tea schools, including the dramatic swipe of the fukusa (silk cloth) over the top of the natsume (tea caddy) during the utensil cleansing of the Yabunochi ceremony. 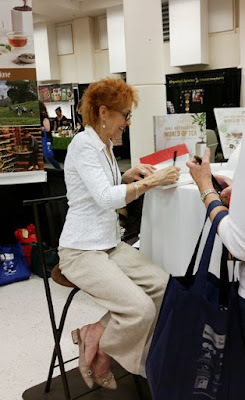 Jane Pettigrew's new book, World of Tea, is a comprehensive guide to tea growing regions and their teas throughout the world. The work of 4 1/2 years, as Jane said, was outdated as soon as it was published because new tea growing regions are popping up all the time. For this presentation, Jane shared the five categories for tea production with examples. China - Tea has been in use as far back as 3,000 years. Trade with the west began in the 17th century with Europe. As an interesting side note, America was drinking tea from China before Britain in New Amsterdam (now New York). 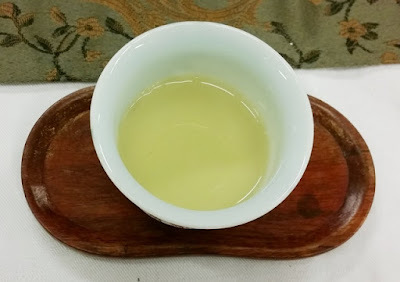 South Korea - Tea was brought to Korea by monks in the 6th and 7th century B.C. With the rise of Confuscianism in the 14th century, Buddhist temples where tea was grown were destroyed, though monks in remote areas continued to drink tea. During Japanese colonization Korean tea was repressed, but the monks continued to drink tea. 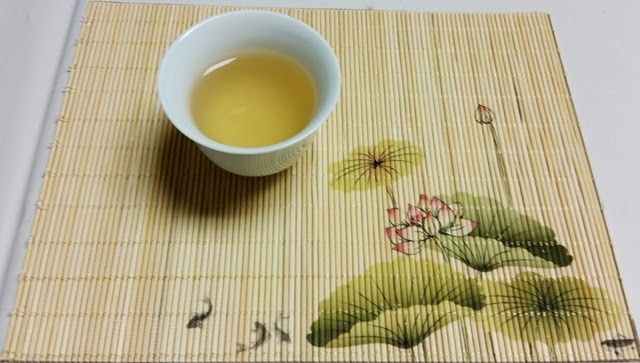 Following independence in 1945 the Korean Way of Tea was revived and new tea bushes were planted. 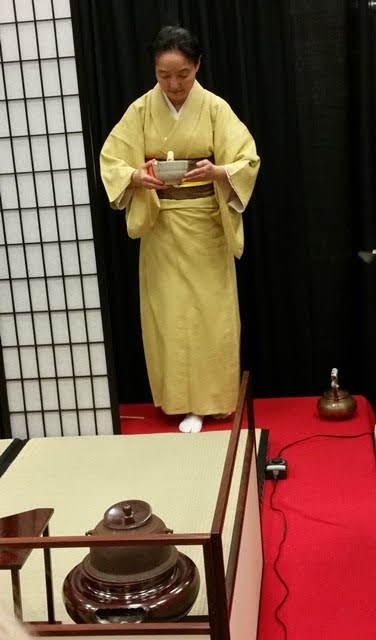 Japan - Tea was brought from China in the 9th century by monks. When China switched from steaming to pan firing in the 15th century, Japan copied them before developing their own method of steaming. By 1869, American tea merchants were importing 1/4 of their tea from Japan. Taiwan - The Dutch East India Company arrived in Formosa (Taiwan) in 1623 and wild tea was discovered in 1645. China took over in 1661 and Formosa was considered part of Fujian with settlers coming over from Fujian's Wuyi mountains and Anxi County. Tea cultivation would begin later in the 19th century with plants from Wuyi. In the 1860s, John Dodd provided support to increase tea production and introduced Taiwanese tea to the world market. Japan took control in 1895 and expanded the local tea industry before control returned to China in 1945. 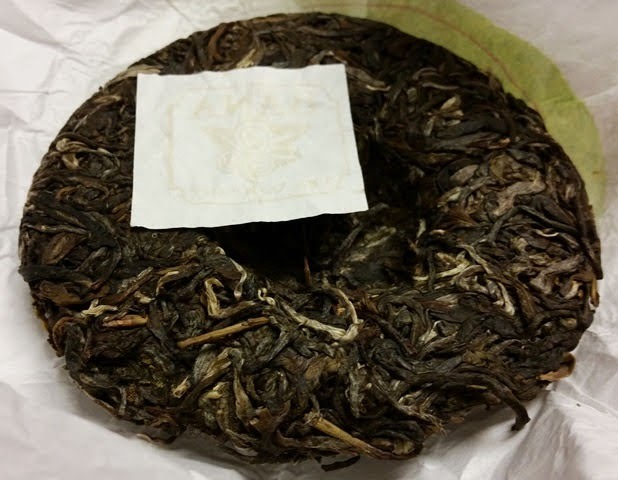 Today, most Taiwanese tea is intended for local markets. Indonesia - During the Dutch colonization tea planting began in 1865 and by 1942 Indonesia was the fourth largest tea producer. They gained independence in 1945 and tea is now produced by small holders on small plots. India - Native tea plants were discovered to be growing in Assam in 1823. The English East India Company sent Chinese tea seeds to experiment, as well. India gained independence in 1947 and continues to be one of the world's largest tea producing nations. Sri Lanka - After a fungus destroyed all the coffee plants in 1869, many farmers turned to growing tea. Following independence from Britain in 1972 the country became Sri Lanka, though they kept the Ceylon name for their tea. East Africa (Kenya) - Tea was first planted in 1903, during British colonization. Since gaining independence in 1963, Kenya has become third largest producer of tea in the world with 15% of black tea intended for breakfast teas. Vietnam - They became a French protectorate in 1883 and in 1890 the first tea estate was established. Tea estates were abandoned following the First Indochina War (1946-1954) and the Vietnam War (1955-1975). Tea production began again in the 1990s with 84% of the production being exported to Russia, Japan, Taiwan, Iraq, and the US. Thailand - Assamica trees were growing wild and the former king encouraged large-scale tea production in northern region. Congo - Tea estates were established in the 1940's and by 2015 were mostly abandoned. MK Shah took over two tea estates with the aim to repopulate and improve health care for the surrounding areas. Colombia - Bitaco has been growing tea since the 1940's. They were producing CTC teas when they closed in the 1970's and in 1984 they began rehabilitating the plants and put money into converting to orthodox tea production. Togo - A Dutch foundation currently has a tea enterprise focused on providing stability for locals. Examples include New Zealand (Zealong, started by a Taiwanese family), Australia (beginning with Nerada Tea Estates in 1971 with more large farms transitioning to tea since tobacco has fallen out of favor), Kangra, India (growing tea since the 1840's, largely abandoned following the 1905 quake, and being revitalized since 2012), and Réunion (Le labyrinthe en-champ-thé (Enchanted Tea Maze)). There is some overlap with other categories, resulting from political changes. 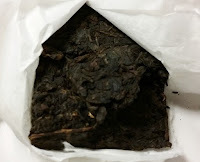 Some examples of recent tea ventures include the Georgia (Republic) which has large and small growers, Hawaii with more than 15 growers, Alabama, Michigan, Mississippi, Canada, Portugal, Scotland, Wales, and Ireland. 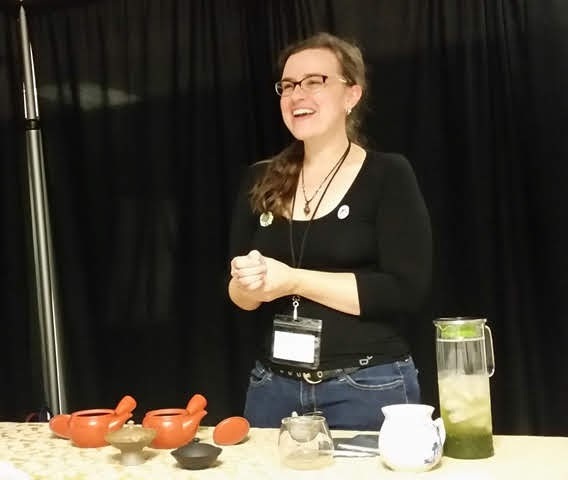 Lauren demonstrated three methods (along with a bonus fourth because time permitted) to prepare gyokuro, proving that this delicate tea can be versatile. 1) Boiling Water: Pour the water over the leaves and immediately pour out. I encountered this style of preparation in Kyoto and am very happy to say that the results were just as delicious as I remember. 2) Room Temperature: Easy and guaranteed not to harm your gyokuro leaves. 3) Shinobi-Style: Gyokuro leaves are placed at the bottom of the teapot and topped with ice cubes. As the ice slowly melts you can pour out and enjoy the deeply savory results, a little at a time. This method is ideal in summertime when the ice will melt more quickly, though you should plan to take time out to relax with a good book. 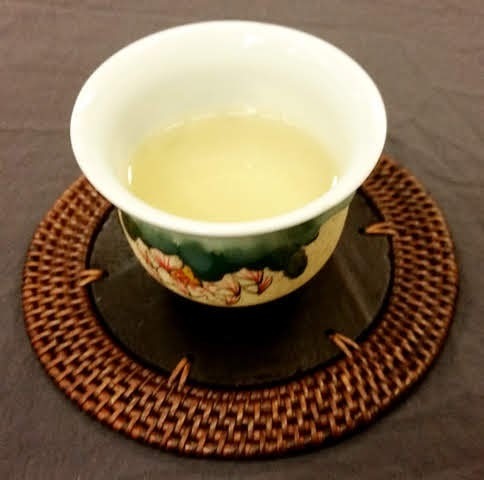 4) 160°F: Gyokuro is more delicate than sencha, so lower temperatures ranging from 140-160°F and steeping times of 30 seconds to 1 minute are recommended for delicious results. 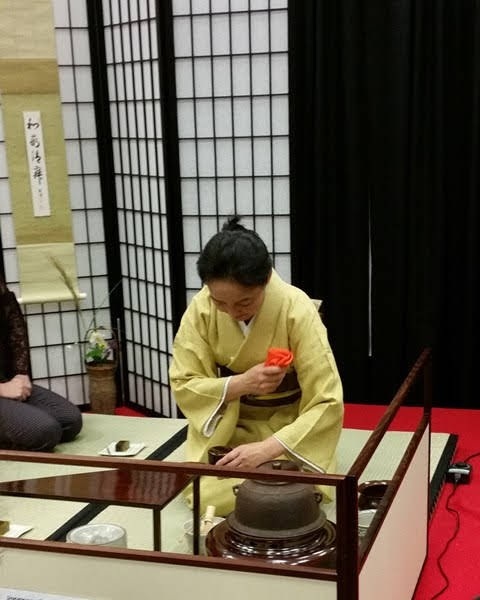 Since this was a relatively large workshop, Lauren used mid-size kyusu to prepare the tea. 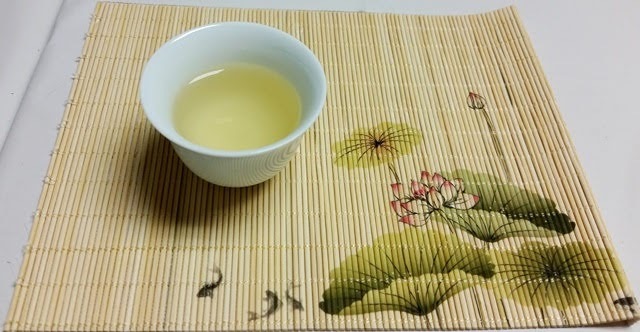 When preparing gyokuro for yourself, shiboridashi like these on loan from Phoenix Tea are ideal. 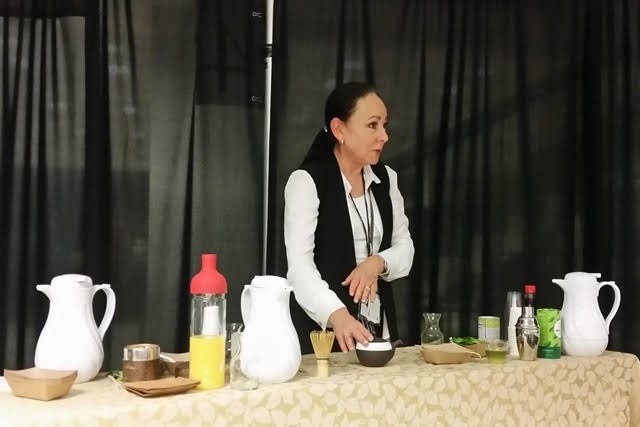 Rona presented a delightful variety of recipes and ideas to integrate green tea into your diet, as well as tips for matcha preparation. When preparing matcha, the water temperature should be around 180F° or lower when preparing higher grade matcha. 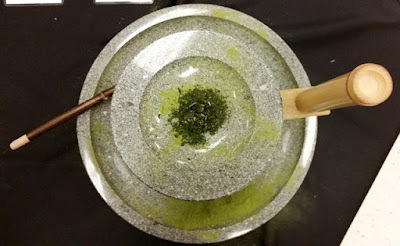 Whisking with a chasen (bamboo whisk) is ideal, though you can use other utensils as long as all the matcha clumps are broken up. Pour matcha over orange juice for a Matcha Sunrise. Make a Green Tea BBQ Rub. Make green tea ice cream (and top with candied ginger). After enjoying gyokuro, drizzle ponzu sauce over the spent leaves for a tasty salad. Make matcha salt (and serve with tempura). We had the opportunity to blend our own bbq sencha rub and we enjoyed freshly whisked matcha, Matcha Sunrise (This will definitely making an appearance in my morning routine. ), and gyokuro with ponzu sauce salad (amazing!). We also used napkins made from tea leaves which I didn't know I needed in my life. 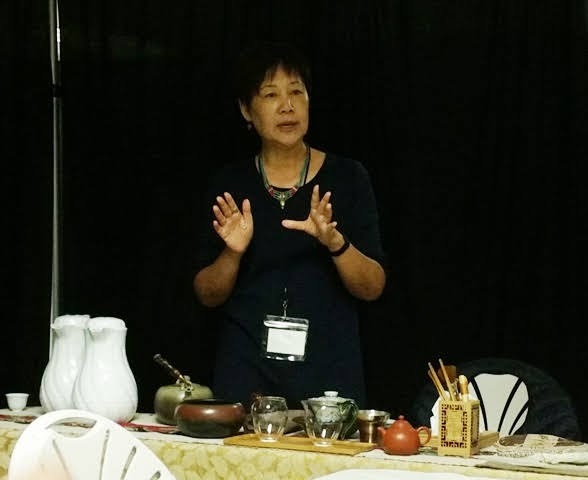 Linda led us through a tasting of three types of pu-erh, explaining how to understand and appreciate the taste as well as the sensory experience. 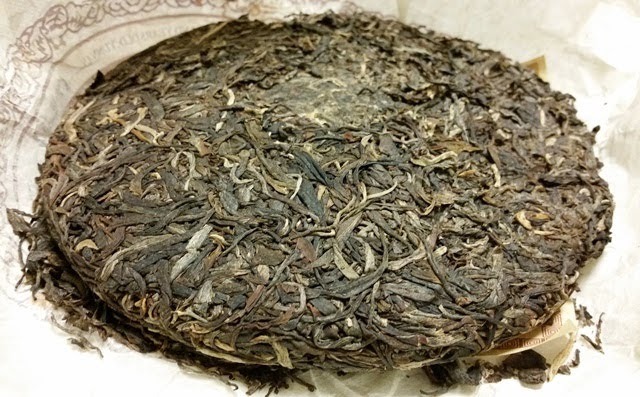 With a standard gaiwan, Linda steeps 6.5-7 grams of leaves in 190-195°F (raw pu-erh) or 208-212°F (ripe pu-erh). 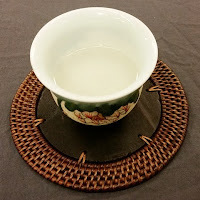 If the pu-erh is in large pieces, throw in some smaller pieces for quick release of flavor and steep the first infusion longer than if the pieces are all small or loose. 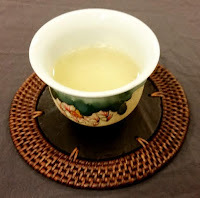 After swallowing the first sip, take a few moments to close your eyes, inhale and exhale, and notice how the tea tastes and how it makes your body feel. 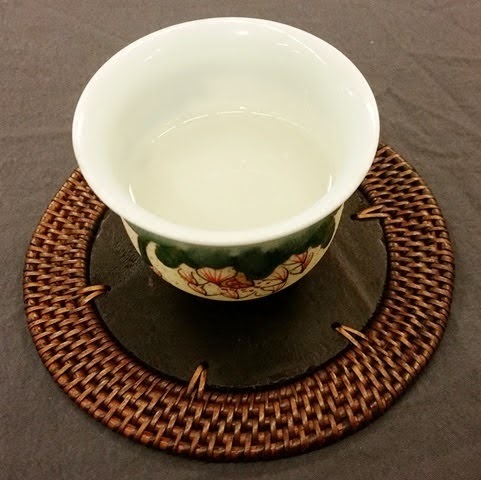 With raw pu-erh, huigan or gan is the minty/cooling/sweet sensation caused by catechins in the tea which follow caffeine's bitterness. With ripe and aged pu-erh, huitian is the returning sweetness experienced after swallowing. 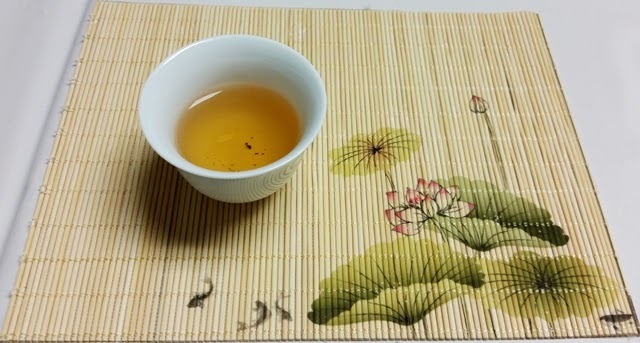 It was interesting to learn that in China the bitter-then-sweet taste of pu-erh can also represent "bittersweet" sentiment and is comforting and encouraging. 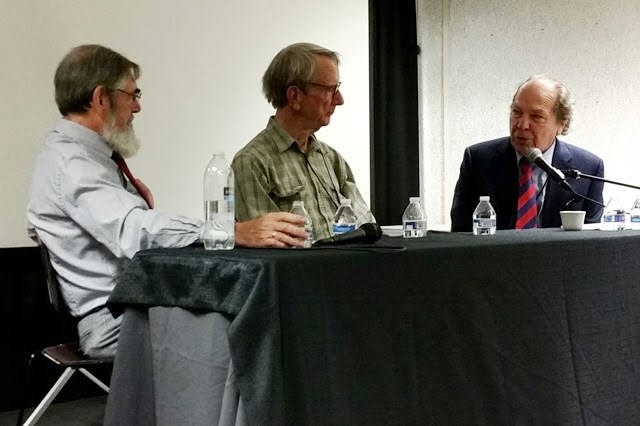 Nigel opened the presentation with a history of tea growing in the US which began in the 18th century when French botanist Andre Michaux brought tea seeds and plants to South Carolina around 1795. In 1848, Dr. Julius Smith began growing tea in South Carolina, intending to make it an industry. In 1858, the US government sent Robert Fortune on a fourth mission to China to bring back tea seeds which were distributed to farmers in six southern states. Due to the Civil War, that venture stagnated. In 1880, John Jackson planted 200 acres in South Carolina with seeds from China, Japan, and India, but that was later abandoned. In 1890, Dr. Charles Shepard began a more successful tea growing venture in South Carolina with Pinehurst Tea Garden, expanding to 125 acres. In 1901, Roswell Trimble's American Tea Growing Company purchased 6,500 acres of land in South Carolina which produced a small amount of tea for the grocery industry before being abandoned. In 1963, Lipton established a tea research station in South Carolina and sent cultivars to other states from which some plants are still growing in California. That tea station was bought by Bigelow and plants were found dating back to the mid-19th century. Mark shared some of the challenges and potential solutions with growing tea in the US. Conditions for growing tea in the Pacific Northwest are good, though California's soil needs to be acidified to balance the high pH. The problem isn't so much growing tea as making it profitable while also dealing with the competitiveness of the estate tea market. Some of this can be mitigated by starting at the market-level, shifting the cost to consumers through ventures like agri-tourism. Hold tastings on location or at a tea shop, offer tours where visitors can see the tea and how it's produced, or offer hands-on experiences. 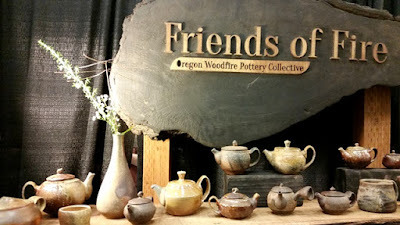 The US League of Tea Growers, now in its third year, is a great resource and anyone growing as little as one plant can join. Additionally, the University of Hawaii has free downloadable publications on tea growing from beginner onward. 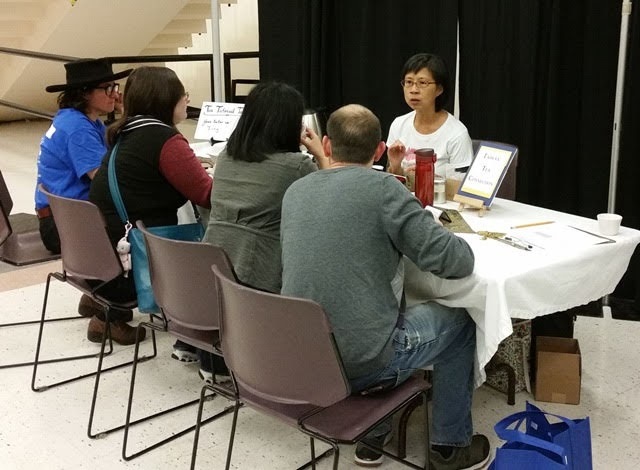 I was honored to be asked to sit on a panel once again with fantastic NW bloggers Char Gascho (Oolong Owl), Stephanie Lemmons Wilson (Steph’s Cup of Tea), and Cinnabar Wright (Gongfu Girl). 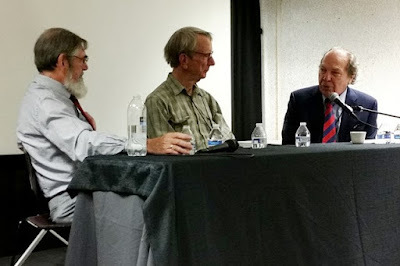 Highlights included a discussion on the merits and challenges of traditional blogging and social media blogging and the importance of including a notation in tea reviews if the tea was provided at no charge by the vendor/tea producer. 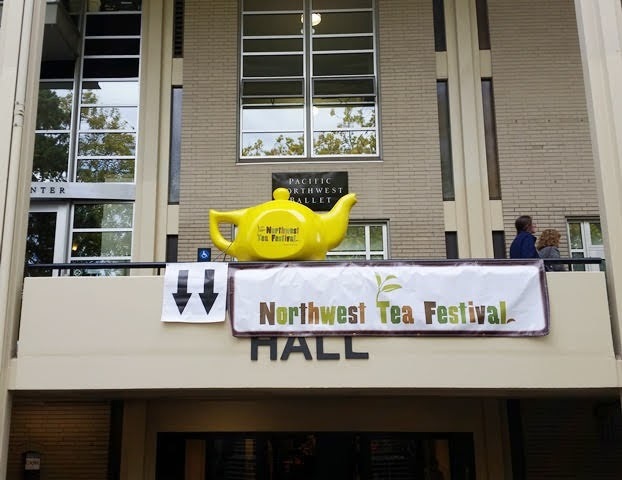 Many, many thanks to everyone who made the Northwest Tea Festival possible! I am ready for 2019!